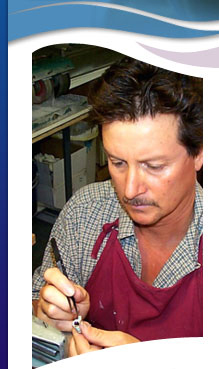 With over thirty years experience as a lapidary or gemcutter, Raoul is known as one of the best inlay artists in the country. As a young designer, Raoul was influenced by renowned Navajo jeweler, the late Charles Loloma, and others from that genre. He has since gone on to develop his own approach to gemstone inlay and gem carving. Largely self-taught, Raoul designs reflect the flavors of Egypt, Italy, and Greece but with a contemporary twist on a jewelry technique that dates back centuries. Living for nearly ten years in Santa Fe, New Mexico, he was inspired by the vibrant jewelry community there as well as the culture and motifs of the Southwest. Raoul paints his designs with vibrant color working from an extensive palette of gems and jewels. The list of stones reads like a world tour: royal blue Lapis Lazuli from Afghanistan, deep purple Sugilite from the Kalahari Desert in Africa, scintillating Opal from Australia and Brazil, just to name a few. Inlay is the process of cutting and fitting gemstones into a channel within the jewelry, such as a ring or bracelet. The stone is then ground flush with diamond tools and polished. Usually the surface is smooth but sometimes Raoul will include sculpted pieces that rise up and add dimension to the finished piece. Someone unfamiliar with the process might look at a bracelet and think it is enameled, it is so smooth and the colors so vibrant. However, each stone is cut and placed individually and the even surface is the result of his highly developeed skill in fitting and polishing the gems. In 1997 Raoul moved to North Carolina and his designs began to reflect the influences of the sea and shore with softer colors and more curvaceous forms. Raoul works with a team of talented goldsmiths to coordinate the creation of their unique designs as inlaid rings, earrings, bracelets and pendants. In recent years Raoul has been incorporating much more sculpture into his designs with the gem itself becoming the primary focus of the jewelry. His gem carvings possess a fluid line, delicate form, and glossy shine that belies the inherent difficulty in working with hard stones. Raoul usually sculpts in translucent gems such as Blue Chalcedony from Africa, green jade-like Chrysoprase from Australia, lavender Holly Blue Agate from Oregon, and multi-hued opal from Australia. He has also turned his hand to crystalline gems such as purple Amethyst and golden Citrine creating fantasy shapes that incorporate both gem-faceting and carving techniques. Inspired by an interest in archeology and ancient civilizations, Sosa would like for his jewelry to become artifacts in the future. His pieces are destined to become heirlooms, jewels of a timeless nature, that will be appreciated by generations to come.